In the summer of 2004 the Coalition began to modify its overall political and military campaign in Iraq. The most visible sign of this was the transition of sovereignty to the IIG, a change that was complemented by the establishment of the US Embassy and MNF-I as replacements for the CPA and CJTF-7, respectively. When the CPA dissolved in June 2004, the US Embassy took over authority for the American reconstruction efforts in Iraq and created the Iraqi Reconstruction Management Office (IRMO) to oversee these operations. In addition, the new US Ambassador to Iraq had supervision of the PCO, a DOD agency staffed by the US Army Corps of Engineers that focused on acquisition and management of US-funded reconstruction projects.130 These two offices worked closely with the UN and other Coalition organizations, such as the United Kingdom’s Department for International Development, to coordinate the Coalition initiatives to improve Iraq’s infrastructure. 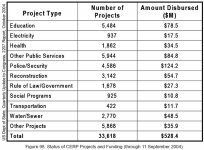 While the IRMO and PCO made use of Iraqi and foreign contractors as well as US governmental organizations such as the USAID, Coalition military forces remained heavily involved in reconstruction. For the senior leaders of US forces, this was largely by choice. When General George W. Casey Jr. took over as commander of MNF-I in July 2004, he ensured that reconstruction became a critical element in his economic line of operation. Moreover, as Casey began moving forward on his plan to reduce the insurgent and militia safe havens in preparation for the January 2005 elections, he found reconstruction activities a key role in stabilizing those cities targeted as safe havens. By rebuilding destroyed infrastructure and enabling local economic activity, reconstruction projects promised to win over and retain the support of the local populations in these former insurgent safe havens. 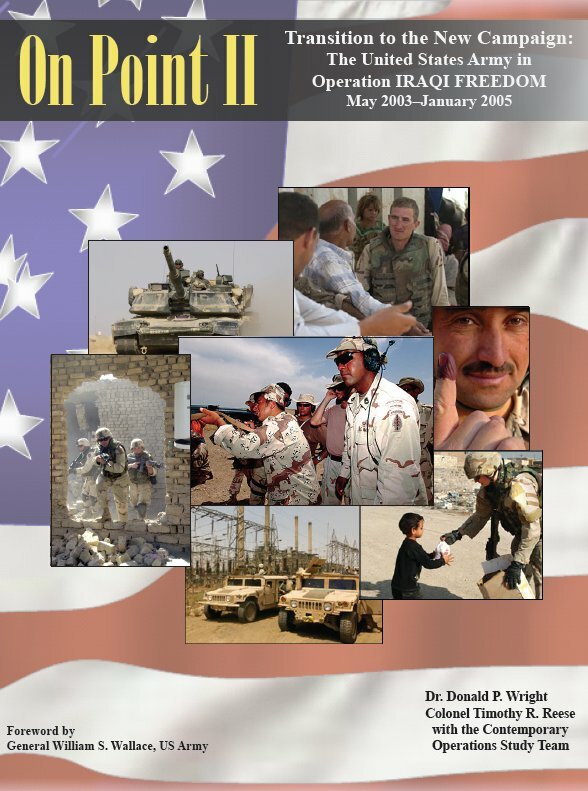 As mentioned earlier in this study, Casey viewed the Coalition’s assault on the Mahdi Army forces in An Najaf in August 2004 as a model to be followed in the reduction of other safe havens.131 One of the critical elements in the Coalition attack on An Najaf was the immediate introduction of reconstruction activities in the aftermath of the fighting that had done great damage to the city and its economic sectors. Major operations that followed the An Najaf assault adopted this template to include reconstruction operations as a significant part of the overall plan. The best examples of this emphasis on reconstruction were the commitment of military forces and other resources for the final phases of the operations against insurgents in Samarra and Fallujah in the fall of 2004. In the plans for both actions, military operations terminated with civil-military missions designed to restore essential services to the cities. Thus, reconstruction became an integral element in the overall operation rather than a follow-on action subject to the availability of scarce engineer and CA units and rebuilding funds. Of course the inclusion of reconstruction efforts in larger operations in Iraq was not exactly new. In the summer of 2003, for example, units in the 4th ID had planned for CMO to follow their major combined arms operations in the Sunni Triangle. On a smaller scale, in the operation that killed Uday and Qusay Hussein, the leaders of the 101st ABN had immediately cleaned up and repaired the area of Mosul where the brothers had been found.132 In the summer of 2004, however, it appears that US Army forces began to place fresh emphasis on reconstruction and viewed these operations as critical to achieving their tactical, operational, and strategic goals in Iraq. Perhaps the best example of this attitude was the approach taken by the units of the 1st CAV in 2004. As noted earlier, the division commander, Major General Chiarelli, had deployed to Iraq believing that restoring essential services to Iraqis was critical to winning the support of those Iraqis who were “sitting on the fence.” While in Iraq, Chiarelli and his subordinate leaders had an “epiphany” about the additional power of reconstruction operations, concluding that when projects aimed at restoring essential services gave jobs to unemployed Iraqi men, attacks on Coalition soldiers and Iraqi security forces decreased.133 Especially convincing to Chiarelli was the division’s experience in Sadr City in the fall of 2004 when new funding allowed his units to employ young Shia men in infrastructure projects that directly benefited the neighborhood. According to the division, these operations reduced attacks on US forces in Sadr City from a high of 160 per week in early October 2004 to an average of less than 10 per week by early November.134 For Chiarelli, this evidence supported the critical concept of using low-level reconstruction projects not only to show the Iraqis how committed the Coalition was to improving their lives, but also to defuse the threats that the insurgency and other violent actors posed to Coalition forces. This belief about the value of low-level projects combined with concerns about the sustained insurgency in Iraq forced the US Government to shift some of the resources in its reconstruction campaign away from the large-scale efforts designed to rebuild the oil sector and the electrical grid. Stuart Bowen, the Special Inspector General for Iraqi Reconstruction (SIGIR), documented this change, stating in his January 2005 report to Congress that the new policy began in September 2004 with a reallocation of $3.4 billion away from large-scale water and electrical projects.137 Within 3 months, the US Embassy in Iraq had given a large portion of these funds to programs aimed at increasing Iraqi employment rates in the cities of An Najaf, Samarra, Sadr City, and Fallujah, many of which were run by US Army units like the 1st CAV. Bowen noted that this was a “significant change in US spending priorities” driven by the desire “to address the need for improved security, to improve Iraq’s economic and political environment, and to create jobs for Iraqis.”138 In addition to the shift of these funds, in the fall of 2004 US Army leaders at the tactical level gained access to a new source of funds called the Commander’s Humanitarian Relief and Reconstruction Projects (CHRRP). Modeled on the CERP and loaded initially with $86 million, the new program was designed to empower commanders to make major strides in key areas such as Baghdad, Samarra, Ramadi, and North Babil province.139 More important was that by creating the CHRRP, US Government representatives were reinforcing the perceived success of the CERP and essentially recognizing the effectiveness of the Army’s efforts to make a difference in Iraqi lives.